We all love a dramatic plot. But, it’s no longer entertainment when drama hits the workplace. Drama in the workplace, and in life, isn’t a new concept. We have all dealt with drama, sometimes more frequently than we care to. Let’s face it, drama is destructive in all places. There are a lot of contributors to drama and, in all circumstances, drama focuses on anxiety and a problem. The anger, frustration, and hurt feelings that drama creates takes up our energy that should be used for better things. 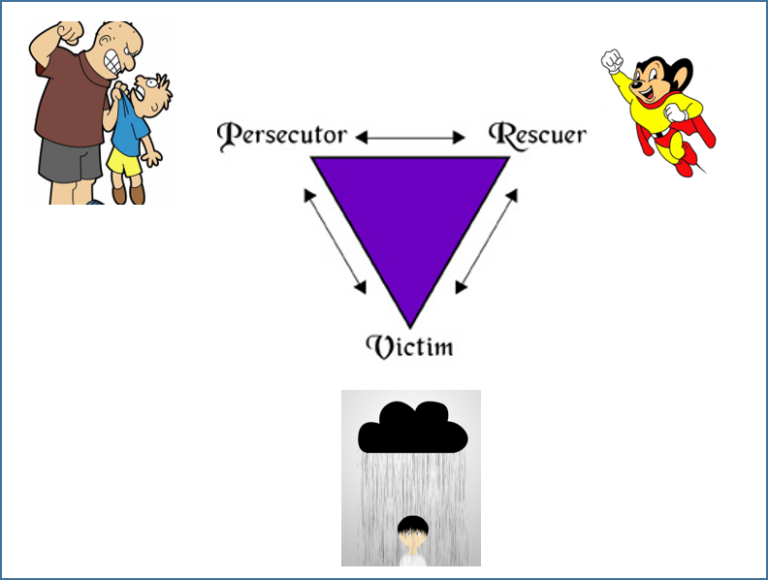 Understanding when drama exists and identifying the 3 roles of the Drama Triangle* (the Victim, the Bully, and the Rescuer), and how those roles co-exist, will help you eliminate drama completely from your personal and professional life. The anchor of every drama-filled situation is the victim role. The victim role is often characterized as helpless, vulnerable, mistreated, blameless, innocent, no control over their circumstances, and feels powerless. We all know people that have played the victim card. And, of course, there are times when we play the victim card, ourselves. The key takeaway that everyone should be aware of is that without a victim, there is no drama. This is why it is very important to recognize when you are playing the victim and/or to be able to identify when someone else is. The rescuer/hero role on the Drama Triangle is an interesting role. While we may all want to be helpful, when we sit in this role, we actually enable the victim to continue to be powerless. After all, rescuers are the fixers, and the protectors in our lives. Wanting to help, yet keeping someone dependent upon you, is not helping anyone. Then comes the role of the bully. A bully is anyone or anything, that creates a sense of helplessness to a victim. Just like the “Big Bad Wolf,” a bully is a villain. They blame, point fingers and can often be very aggressive. When is a bully not a person? When your car breaks down, that can be cause to create helplessness; hence, the broken down car is the bully that is putting you in a victim role. Ever notice how sometimes some drama situations get super intense? That’s due to the circumstance known as the “velocity” of drama. The velocity of drama is created by how many times people switch roles on the triangle in the same scenario. For example, let’s say a victim approaches a rescuer to help them with something they could do themselves. And, the rescuer recognizes this and declines to enable the victim. The victim can then move along the trail and adopt the bully role and the rescuer can move to the victim role. It’s just like musical chairs. 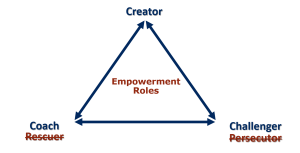 We can, and do, switch roles on the Drama Triangle very often. The more often roles are switching, the higher the velocity of the drama and ultimate intensity of it. You guessed it! The role of the victim, once eradicated ends the drama. In the diagram below, you will see the triangle has been flipped upright and the names of the roles on the triangle have changed. This is otherwise known as The Empowerment Dynamic (TED)**. TED shifts the victim into a creator role. A creator of their own circumstances. We own the capacity for creative outcomes and choosing our own responses and reactions to circumstances and events. In this role, the creator now sees what was the bully, as a challenge, instead. It is an opportunity for the victim to create their solutions to the challenges that they have. The rescuer role moves to being a coach. Coaches empower – they do not enable. So there you have it. The GutwiZdom on how to end drama in your life. You have the remedy, now pay it forward and let’s move forward to a zero-tolerance policy on drama – together!